On February 13, eleven elementary school teachers and people affiliated with the Ministry of National Education from the Republic of Senegal started a training program in which university faculty members will provide instruction on teaching elementary math and science. The training program, which is one of the activities conducted by the Japan International Cooperation Agency (JICA)’s Training and Dialogue Program, will run for about three weeks, until March 9. In countries throughout Africa including Senegal, improving the quality of education has become an issue. During this training program, there are plans for participants to learn how to create teaching plans through lectures and practical training, visit pre-schools and elementary schools in Fukuyama-shi, Hiroshima, and Okayama University affiliated schools, and tour the Okayama Prefectural Education Center. 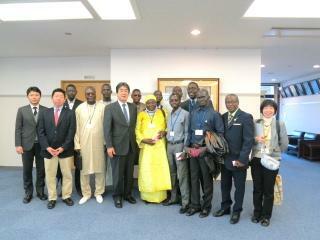 Seventeen people, including Masaru Araki, Director of the Center For Global Partnerships and Education; Shigenobu Takatsuka, Dean of the Graduate School of Education; and Mr. Kimio Fukazawa, a member of the Training Program Division of the JICA Chugoku International Center, attended the opening ceremony, which was held in the Education Faculty Building on February 13. In his greeting Director Araki stated, “I am looking forward to seeing the teachings methods learned in this program used in numerous schools throughout Africa.” On the same day, all the trainees paid a courtesy call to President Kiyoshi Morita, who expressed words of encouragement.